My service area covers all cities in San Mateo County. Cities included: San Bruno,Millbrae, Burlingame, San Mateo, Belmont, San Carlos, Foster City, Redwood City and Menlo Park. 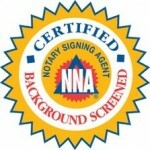 I am an certified Loan Signing Agent by the National Notary Association.